I’ve on occasion mentioned my uncle Curt Hunter. Curt was tight when it came to his finances but generous with all us young ones. He worked everyday at the coal mines and still had the energy to care for his family and home. One sunny spring afternoon Curt came home with his black Ford pick-up loaded to the top bar of the bed racks. My little brother and I along with Curt’s son Fred all gathered around the Ford truck to see what was loaded on it. Curt said we could help unload the wooden crates off his truck. The largest crate had a stencil on its side that proclaimed this was a David Bradley/Sears and Roebuck garden tractor. There was a very complete owners, shop, and parts manual packed inside a manila envelope that was stapled to the crate. Curt offered each of us twenty five cents to hang around and help him assemble the little machine. The largest crate had “Open First” stenciled on it in addition to the other aforementioned information. The big wood create was taken apart oh so carefully to avoid damage to the contents. I’ll always wonder how people build ships in bottles and how the tractor builders got almost the entire machine into the box they used. The smaller crates contained all the implements. The tractor was almost ready to go right out of the box. We put on the wheels/tires and the control/handle bar assemblies. The three horse power engine needed oil and gasoline. Once we had taken care of those two items we were ready to start it up. One pull and it came to life. Wasn’t long until the burning paint and exhaust odor let us all know there was a new toy in the neighborhood. Garden tractors are boring and slow. I think it’s a quality built into the little mechanical beast of burden. This one was no exception. The Sears, Roebuck was, however, a pretty little devil. It had a certain appeal that made you like it and place it above all those other ugly ducklings that were called walk-behind garden tractors. Curt’s tractor had a slightly different color scheme than the examples I could find online, but these examples nevertheless show the tractor. Did it work — yes it did. Curt had purchased a small breaking plow among the numerous implements he ordered. He set the tractor up with that plow and plowed all of the garden in no time. He made a fine garden that year and every year after until he died. I’d surely like to go to Curt’s old home place and just snoop around. Curt, like myself, was a hoarder. Couldn’t look on anything and say it was beyond repair. 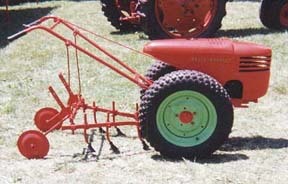 When my health was better and the cost of medical care was more reasonable I got into the hobby of old tractors. Every old fart in this and surrounding counties collects tractors. It’s not unusual to find an old tractor that has been sitting inside an old building for years. Some of yesterday’s machines are still pretty amazing. I certainly remember Sears, Roebuck and company and there was always a Sears-Roebuck catalogue in our house; as well as being a handy thing to have around when mom and dad needed something it presented hours of diversions for my brother and myself. We made a game of it — we would go through the catalogue page by page (scrupulously avoiding the ‘lingere’ section) and choose one item each on each page to “buy”. On some pages, choosing only one item was too much of a challange so we bent the rule and allowed two each. Of course we never bought anything but in a way known only to a kid, we owned what we chose. The Sears catalogs had other, very practical uses once they were out of date. I actually remember outhouses where the Sears catalog served a pretty useful function. They had a lingerie section? Really…?